For five years, Donald Trump, more than anyone else, popularized the slander that President Barack Obama was born in Kenya–and was therefore not an American citizen. In April, 2011, Obama released the long-form version of his Hawaiian birth certificate. Still, Trump questioned its–and Obama’s–legitimacy. For more than a year during his 2016 Presidential campaign, Trump continued doing so. Meanwhile, Trump’s popularity steadily fell among blacks. In June, 2016, a Quinnipiac poll revealed that Trump had 1% of support from black voters–while 91% of black voters backed Hillary Clinton. Even the managers of Trump’s campaign urged him to put the “birther” issue behind him. And so, on September 16, 2016–10 days before his scheduled first debate with Democratic Presidential nominee Hillary Clinton–Trump made his version of a reversal. “Now, not to mention her in the same breath, but Hillary Clinton and her campaign of 2008 started the birther controversy. “I finished it. I finished it. You know what I mean. His tone made it clear that he felt uneasy making that statement–and wanted to get it over with as fast as possible. He refused to take questions from reporters covering the event. Nor did he apologize for his five-year campaign of slander. “Then, of course, there were those who questioned, and who continue to question for the past eight years, and up to this very day, whether my husband was even born in this country. But perhaps the best perspective on this event was provided by syndicated columnist Mark Shields and New York Times columnist David Brooks. Each Friday they appear on the PBS Newshour to review the week’s major political events. On September 16, Shields (a liberal) and Brooks (a conservative) addressed Trump’s about-face on birtherism. 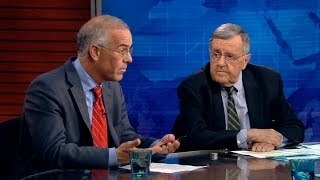 MARK SHIELDS: “I think it’s important to establish right at the outset that [Trump] wasn’t only the loudest and the highest-profile and the most persistent and the most well-publicized birther, he, Donald Trump. He lied. He lied consistently and persistently. “And, today, without explanation or excuse, he just changed his position and tried to absolutely falsely shift the blame onto Hillary Clinton. DAVID BROOKS: “Usually, there’s some tangential relationship to the truth, but a corroding relationship to the truth, frankly, as politics has gone on over the years. “But now we’re in a reverse, Orwellian inversion of the truth with this. And so we have a team of staffers and then the candidate himself who have taken the normal spin and smashed all the rules. “And so we are really in Orwell land. We are in 1984. And it’s interesting that an authoritarian personality type comes in at the same time with a complete disrespect for even tangential relationship to the truth that words are unmoored. “And so I do think this statement sort of shocked me with the purification of a lot of terrible trends that have been happening. And so what’s white is black, and what is up is down, what is down is up. And that really is something new in politics. Americans were slow to recognize the dangers of their government’s committing armed forces to South Vietnam. But when the record of government lies reached critical mass, Americans demanded an end to the war. Similarly, Americans were reluctant to brand Richard Nixon, their newly-re-elected President, a criminal worthy of impeachment. But when the evidence of his criminality steadily mounted, they demanded his ouster. Today, Americans are flooded with overwhelming evidence of Donald Trump’s unfitness to become President. His narcissism, vindictiveness, ignorance and hair-trigger temper have been on public display for more than a year. Yet millions of ignorant, hate-filled, Right-wing Americans plan to catapult this man–who “debased democracy, debased the national debate, appealed to that which is most ignoble or least noble in all of us”–to the Presidency. If that happens, future historians–if there are any–may similarly condemn those Americans who stood by like “good Germans” and allowed their country to fall into the hands of a ruthless tyrant. In 2011, Donald Trump, host of NBC’s “The Apprentice,” was thinking of running for President against Barack Obama. Seeking to gain popularity among America’s Right-wing, Trump almost singlehandedly created the popular fiction that the President was born in Kenya–and was not an American citizen. His motive: To convince Americans that Obama was an illegitimate President. On April 27, President Obama released his original, long-form Hawiian birth certificate. “We do not have time for this kind of silliness,” said Obama at a press conference, speaking as a father might to a roomful of spiteful children. “We have better stuff to do. I have got better stuff to do. We have got big problems to solve. And on May 1, he announced the solving of one of those “big problems”: Osama bin Laden, mastermind of the September 11, 2001 terrorist attacks, had been tracked down and shot dead by elite U.S. Navy SEALS in Pakistan. Even after declaring his candidacy for President on June 16, 2015, Trump continued to insist that Barack Obama was an illegitimate President. Meanwhile, Trump’s popularity among blacks had steadily fallen. In June, 2016, a Quinnipiac poll revealed that Trump had 1% of support from black voters. By comparison, 91% of black voters backed Hillary Clinton. His enthusiastic support by racist white supremacist organizations such as the Ku Klux Klan and the American Nazi Party. His “birther” attacks on President Obama as a non-citizen from Kenya–and thus ineligible to hold the Presidency. His attacks on the Black Lives Matter movement and calling on his supporters at rallies to rough up minority protesters. And so, on September 16–10 days before his scheduled first debate with Democratic Presidential nominee Hillary Clinton–Trump made his version of a reversal. “Credibility gap” is a term that came into use during the mid-1960s to describe public and journalistic distrust of President Lyndon B. Johnson. In particular, the term was applied to his administration’s conduct of the Vietnam war. It was, in short, a euphemism for accusing government officials of outright lying. An example of the credibility gap in full swing appeared in Stanley Kubrick’s classic 1987 Vietnam war movie, Full Metal Jacket. Vietnam was a war where military and political officials spewed a gung-ho version of constant American progress against a tough enemy. And where civilian reporters like David Halberstam and Walter Cronkite saw–and labeled–the war as a brutal, wasteful and ultimately doomed effort. Midway through the film, there’s an editorial meeting of The Sea Tiger, the official Marine newspaper. Story #1: DIPLOMATS IN DUNGAREES–MARINE ENGINEERS LEND A HELPING HAND REBUILDING DONG PHUC VILLAGES. Story #2: N.V.A. SOLDIER DESERTS AFTER READING PAMPHLETS. Story #3: NOT WHILE WE’RE EATING: N.V.A. LEARN MARINES ON A SEARCH AND DESTROY MISSION DON’T LIKE TO BE INTERRUPTED WHILE EATING CHOW. Reporters who dared to write truthfully about the military’s crimes and failures–like David Halberstam of the New York Times and Peter Arnett of the Associated Press–were regarded as traitors by military and political officials. In 1963, President John F. Kennedy became enraged by Halberstam’s reporting on the corruption of the South Vietnamese government. He pressured New York Times publisher Arthur Ochs Sulzberger to transfer Halberstam to another locale. Sulzberger politely refused–and then extended Halberstam’s stay in Vietnam another six months. In 1965, when CBS Correspondent Morley Safer filmed Marines setting fire to the village of Cam Ne with Zippo lighters, President Lyndon B. Johnson was similarly outraged. The trail of deceit and attempted censorship continued right up to the end of the war–in April, 1975. That was when North Vietnamese forces invaded the South and quickly overwhelmed the incompetent defenses arrayed against them. And while America was still bogged down in Vietnam, the Watergate scandal erupted on June 17, 1972. Members of the Nixon administration’s secret “Plumbers Unit” burglarized the offices of the Democratic National Committee at the Watergate Hotel. Obsessed with re-electing Richard Nixon, they sought incriminating information to discredit U.S. Senator George McGovern, the Democrats’ nominee for President. When the burglars were caught, President Richard M. Nixon and his topmost officials lied and stonewalled both reporters and investigators seeking the truth. In short: We’ve been lying to you for the last 10 months. But now we’re telling the truth. Like Vietnam, the Watergate scandal destroyed the reputations of many of its chief architects. Forty government officials were indicted or jailed. Vietnam and Watergate were seminal events for Americans coming of age in the late 1960s and early 1970s. They taught an entire generation: Don’t trust the government. Its officials routinely lie, and their lies can be deadly. It didn’t take much for American Right-wingers to start salivating–and celebrating. All it took was for Russia to move troops into its neighboring territories of Ukraine and Crimea. The torch had barely gone out at the much-ballyhooed 2014 Sochi Olympics when Russian President Vladimir Putin began menacing the Ukraine. Even while the Olympics played out on television, Ukrainians had rioted in Kiev and evicted their corrupt, luxury-loving president, Victor Yanukovych. And this, of course, didn’t sit well with his “sponsor”–Putin. Yanukovych had rejected a pending European Union association agreement. He had chosen instead to pursue a Russian loan bailout and closer ties with Russia. And that had sat well with Putin. So it was almost a certainty that, when his chosen puppet, Yanukovych, was sent packing, Putin would find some way to retaliate. And since late February, 2014, he has done so, gradually moving Russian troops into Ukraine and its autonomous republic, Crimea. By late March, it was clear that Russia had sufficient forces in both Ukraine and Crimea to wreak any amount of destruction Putin may wish to inflict. Or at least to use such events to their own political advantage. Right-wingers such as Mitt Romney, the former governor of Massachussetts who lost the 2012 Presidential election by a wide margin to Barack Obama. “There’s no question but that the president’s naiveté with regards to Russia,” said Romney on March 23, 2014. All of which overlooks a number of brutal political truths. First, all great powers have spheres of interest–and jealously guard them. For the United States, it’s Latin and Central America, as established by the Monroe Doctrine. And just what is the Monroe Doctrine? It’s a statement made by President James Monroe in his 1823 annual message to Congress, which warned European powers not to interfere in the affairs of the Western Hemisphere. It has no other legitimacy than the willingness of the United States to use armed force to back it up. When the United States no longer has the will or resources to enforce the Doctrine, it will cease to have meaning. For the Soviet Union, its spheres of influence include the Ukraine. Long known as “the breadbasket of Russia,” in 2011, it was the world’s third-largest grain exporter. Russia will no more give up access to that breadbasket than the United States would part with the rich farming states of the Midwest. Second, spheres of influence often prove disastrous to those smaller countries affected. Throughout Latin and Central America, the United States remains highly unpopular for its brutal use of “gunboat diplomacy” during the 20th century. Among those countries invaded or controlled by America: Mexico, Cuba, Guatemala, Nicaragua, Columbia, Panama and the Dominican Republic. The resulting anger has led many Latin and Central Americans to support Communist Cuba, even though its political oppression and economic failure are universally apparent. Similarly, the Union of Soviet Socialist Republics (U.S.S.R.) forced many nations–such as Poland, Hungary and Czechoslavakia–to submit to the will of Moscow. The alternative? The threat of Soviet invasion–as occurred in Hungary in 1956 and Czechoslovakia in 1968. Third, even “great powers” are not all-powerful. In 1949, after a long civil war, the forces of Mao Tse-tung defeated the Nationalist armies of Chaing Kai-Shek, who withdrew to Taiwan. China had never been a territory of the United States. Nor could the United States have prevented Mao from defeating the corrupt, ineptly-led Nationalist forces. The fear of being accused of “losing” another country led Presidents John F. Kennedy, Lyndon B. Johnson and Richard M. Nixon to tragically commit the United States to “roll back” Communism in Cuba and Vietnam. Now Republicans–who claim the United States can’t afford to provide healthcare for its poorest citizens–want to turn the national budget over to the Pentagon. They want the United States to “intervene” in Syria–even though this civil war pits Al Qaeda and Hezbollah, two of America’s greatest enemies, against each other. They want the United States to “intervene” in Ukraine–even though this would mean going to war with the only nuclear power capable of turning America into an atomic graveyard. Before plunging into conflicts that don’t concern us and where there is absolutely nothing to “win,” Americans would do well to remember the above-stated lessons of history. And to learn from them. So why are so many poor Americans now flocking to this party’s banner? Two reasons: Racism and greed. There are historical parallels for both. In 1999, historian Victor Davis Hanson noted the huge gap in wealth between the aristocratic, slave-owning minority of the pre-Civil War South and the vast majority of poor white Southerners. He supplied the answer in his brilliant work on military history, The Soul of Battle: From Ancient Times to the Present Day, How Three Great Liberators Vanquished Tyranny. One of those liberators was General William Tecumseh Sherman, who led 62,000 Union troops in a victorious “March to the Sea” through the Confederacy in 1864. So why did so many poor Southern whites literally lay down their lives for the wealthy planter class, which despised them? According to Hanson: “Behind the entire social fabric of the South lay slavery. Similarly, poor whites now flock to the Republican Party–which holds them in equal contempt– in large part to protest the 2008 election of the first black President of the United States. Since the 1960s, Republicans have pursued a campaign policy of “divide and rule”–divide the nation along racial lines and reap the benefits at election time. Republicans opposed the Civil Rights Act of 1964. Republicans opposed the Voting Rights Act of 1965. Republicans, with Richard Nixon as their Presidential candidate in 1968 and 1972, pursued what they called a “Southern strategy”: Use “code language” to stoke fear and hatred of blacks among whites. And they can do so in a more socially acceptable way than joining a certified hate group such as the American Nazi Party or Ku Klux Klan. 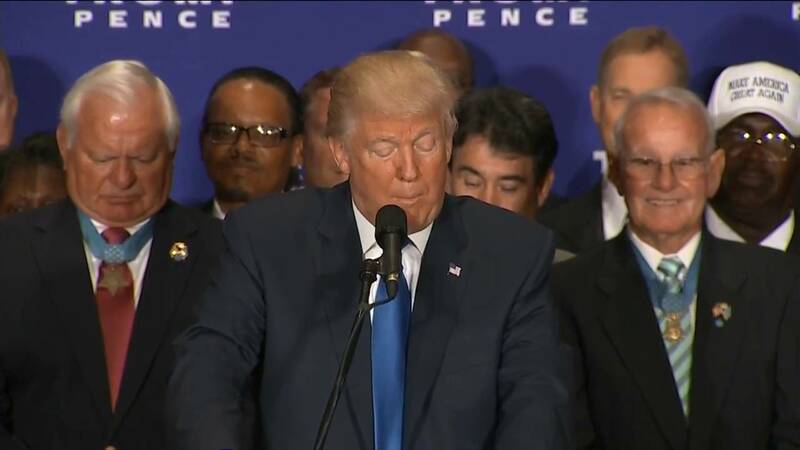 Since 2015, openly racist groups such as the Klan and the American Nazi Party have flocked to the banner of Presidential candidate mogul Donald Trump. By enthusiastically courting their support, the real estate mogul has made it possible for Republican candidates to openly display their own racism. By “us” he means his fellow conservatives who fear losing their property and exalted status by supporting American independence from Great Britain. They forget–or ignore–the truth that government, for all its imperfections, is sometimes all that stands between them and a wide range of predators. Unless the Democratic Party can find ways to directly address these bitter, Politically Incorrect truths, it will continue its decline into insignificance. The Pew Foundation, analyzing voter identification, found “the electorate’s partisan affiliations have shifted significantly” since Barack Obama won office in 2008. A seven-point Democratic advantage among whites under age 30 three years ago had turned into an 11-point GOP advantage. And a 15-point Democratic advantage among whites earning less than $30,000 annually had swung to a slim four-point Republican edge by 2011. The GOP gains had occurred only among white voters. Republicans had made sizable gains among white voters since 2008. Fifty-two percent of white voters called themselves Republicans or leaned to the GOP, compared with 39% who affiliated with the Democratic Party or leaned Democratic. Democrats had lost their edge among lower income white voters. In 2008, Democrats had a 15 point lead among white voters with family incomes less than $30,000. By 2011, Republicans had a four-point edge among this group. The GOP’s lead among middle income white voters had grown since 2008, and Republicans held a substantial advantage with higher income white voters. Republicans have made gains among whites with a high school education or less. The GOP’s advantage over Democrats had grown from one point in 2008 to 17 points in 2011 among less educated whites. Republicans had made smaller gains among whites voters who had college degrees. What is fascinating about these findings is this: The Republicans have, since 1980, pursued a policy of gutting programs aimed at helping the poor–while repeatedly creating tax-breaks for the wealthiest 1% of the population. Among those charting Reagan’s legacy as President was former CBS Correspondent David Shoenbrum. On January 28, 1981, keeping a pledge to his financial backers in the oil industry, Reagan abolished Federal controls on the price of oil. Within a week, Exxon, Texaco and Shell raised gasoline prices and prices of home heating oil. Reagan saw it as his duty to put a floor under prices, not a ceiling above them. But putting a high-profits tax on price-gouging corporations or filing anti-trust suits against them was “Communistic” and therefore intolerable. Tax-breaks for wealthy businesses meant helping America become stronger. But welfare for the poor or the victims of a predatory marketplace economy weakened America by sapping its morale. “In short, welfare for the rich is good for America. But welfare for the poor is bad for America, even for the poor themselves, for it encourages them to be shiftless and lazy. “Somehow, loans to the inefficient management of American corporations would not similarly encourage them in their inefficient methods,” wrote Shoenbrun. Republicans have sought to dismantle Social Security ever since that program began in 1935. And Republicans have furiously opposed other programs aiding the poor and middle-class—such as Medicare, food stamps and WIC (Women, Infants, Children). In short, this is not a political party with a history of rushing to the defense of those most in need. So the question remains: Why are so many poor Americans flocking to its banner? The answer lies in the history of the American South–and slavery. With more than 240,000 employees, the Department of Homeland Security (DHS) is the third largest Cabinet department, after the Departments of Defense and Veterans Affairs. The Defense Department is charged with military actions abroad. DHS is responsible for protecting the United States inside and outside its borders. Its goal is to prepare for, prevent and–if prevention fails–respond to man-made accidents, natural disasters and terrorism. Some of DHS’s agencies–like FEMA and the Secret Service–are well-known. Others–such as the Federal Law Enforcement Training Center and the Domestic Nuclear Detection Office–are not. Yet each has a vital role to play in protecting the nation. A nation whose security Republicans were willing to threaten to get their way on a matter of domestic policy. Coast Guard to save those in ocean peril and defend our maritime borders. Right-wing Republicans argued that even if DHS’s funding were stopped, most of its employees would stay on the job. That’s because they perform work considered necessary to protect human life and property. But while those employees were safeguarding the country, they wouldn’t be paid until the shutdown ended. It’s hard to give your full attention to protecting the lives of others when you have to worry about paying a mortgage or feeding your family. Of course, the Republicans responsible for this shutdown would continue to receive their hefty paychecks. And there was something else to consider. DHS is best-known for its mission to prevent terrorist attacks on America. And America seemed to be in the crosshairs of North Korean terrorism at that very moment. On November 14, 2014, Sony Pictures came under relentless attack by cyberterrorists, who the FBI has linked to North Korea. The reason? Sony’s production of “The Interview,” a comedy depicting the assassination of North Korean dictator Kim Jong Un. Calling themselves “Guardians of Peace,” or GOP, they shut down the company’s computer system and revealed employees’ personal information such as salaries, addresses, and Social Security numbers. On December 17, 2014, Sony Pictures cancelled the Christmas Day premier of “The Interview” after the nation’s five largest movie chains refused to show the movie, following a terror threat posted online. And then on February 5, 2015, Anthem Insurance announced that its database had been hacked–and sensitive medical information on up to 80 million customers and employees accessed. According to an anonymous source, the hackers used malware that had been used almost exclusively by Chinese cyberspies. As the Third Reich came to its fiery end, Adolf Hitler sought to punish the German people for being “unworthy” of his “genius” and losing the war he had started. In his infamous “Nero Order,” he decreed the destruction of everything still remaining–industries, ships, harbors, communications, roads, mines, bridges, stores, utility plants, food stuffs. Fortunately for Germany, one man–Albert Speer–finally broke ranks with his Fuehrer. Risking death, he refused to carry out Hitler’s “scorched earth” order. Even more important, he mounted a successful effort to block such destruction or persuade influential military and civilian leaders to disobey the order as well. As a result, those targets slated for destruction were spared. Since the election of America’s first black President, Republicans have waged a similar “scorched earth” campaign. Literally during his first Inauguration, Republicans, in a secret meeting, agreed to block every effort he made to repair the economy. Acting as extortionists, they repeatedly threatened to shut down the government if they didn’t get their way in legislative matters. And just as repeatedly, they blocked legislation that would have helped the poor, unemployed, women, elderly, disabled or middle-class. At the center of their fury has been the Affordable Care Act, providing medical care to all citizens. Even after Congress passed it and the Supreme Court affirmed it, House Republicans shut down the government in October, 2013. By doing so, they hoped to pressure Obama into killing his signature piece of legislation. The effort failed. As the Obama administration nears its end, no Republican Albert Speer has come forward to save America from the self-destructive excesses of this Nation’s own fanatics. During the summer of 2011, Republicans refused to raise the debt ceiling unless Democrats agreed to massively cut social programs for the elderly, poor and disabled. If Congress failed to raise the borrowing limit of the federal government by August 2, the date when the U.S. reached the limit of its borrowing abilities, America would begin defaulting on its loans. “If you don’t send out Social Security checks, I would hate to think about the credit meeting at S&P and Moody’s the next morning. “If you’re not paying millions and millions and millions of people that range in age from 65 on up, money you promised them, you’re not a AAA,” said Buffett. A triple-A credit rating is the highest possible rating that can be achieved. And while Republicans demanded that the disadvantaged tighten their belts, they rejected any raising of taxes on their foremost constituency–the wealthiest 1%. As the calendar moved ever closer to the fateful date of August 2, Republican leaders continued to insist: Any deal that includes taxes “can’t pass the House. ”To prevent the government from defaulting on its loans, President Barack Obama agreed to sign the Republican-crafted Budget Control Act (BCA) of 2011. The Act provided for a Joint Select Committee on Deficit Reduction to produce legislation by late November to decrease the deficit by $1.2 trillion over ten years. When the so-called “Super Committee” failed to reach agreement, the second part of the BCA went into effect. This directed automatic across-the-board cuts (known as “sequestrations”) split evenly between defense and domestic spending, beginning on January 2, 2013. A major casualty of sequestration has been the Centers for Disease Control and Prevention (CDC). And this has threatened the safety of the Nation Republicans claim to love. In 2013, the CDC was forced to cut 5%, or more than $285 million, from its budget. The sequester cut $195 million from the National Centers for Emerging and Zoonotic Infectious Diseases, a CDC program that tries to prevent illness and death from infectious disease. For fiscal 2014, CDC’s budget was $5.9 billion, down from the $6.5 billion allotted in 2010. In October, 2014, for the first time in United States history, the CDC faced an unexpected outbreak of the dreaded Ebola virus. To Americans’ horror, the agency initially seemed unable to deal effectively with the threat. Moreover, the Nation was confronting the Ebola crisis without a Surgeon General–thanks to NRA-funded Republican Senators. President Obama had nominated Dr. Vivek Murthy for the spot in November, 2013, when the previous surgeon general left the position.But the Senate still hadn’t approved Murthy. At the same time, Republicans rushed to blame President Obama for the continuing Ebola menace in West Africa–and the danger it posed to Americans. But then a new Republican-inspired crisis threatened America. On December 13, 2014, the U.S. Senate passed a $1.1 trillion spending bill to fund almost the entire government through the September 30 end of the fiscal year. But one Federal agency was pointedly exempted from full funding: The Department of Homeland Security (DHS). President George W. Bush had created this agency to safeguard the nation against terrorism. But he didn’t imagine that his fellow Republicans might willingly jeopardize the security of the Nation. President Obama had requested $38.2 billion to fund DHS through fiscal year 2015. But Republicans ensured that its funding would end on February 27. Republicans had gained control of the House of Representatives after the 2010 elections. And then they gained control of the Senate with the 2014 elections. With their newfound majorities in both houses of Congress, they intended to hold the security of the United States as a hostage. Their goal: To force Obama to rescind the changes he had made in American immigration policy. Homeland Security was charged with implementing those changes. And Republicans intended to strip it of funding to do so. And if that meant allowing DHS to “twist slowly, slowly in the wind” (to use a phrase made infamous by the Nixon administration) while Republicans played out their latest power-game, so be it. This was no small matter. With more than 240,000 employees, DHS is the third largest Cabinet department, after the Departments of Defense and Veterans Affairs. The Defense Department is charged with protecting the United States through military action abroad. DHS is responsible for safeguarding the Nation inside and outside its borders. Its goal is to prepare for, prevent and–if prevention fails–respond to man-made accidents, natural disasters and terrorism. Albert Speer, Minister of Armaments for the Third Reich, was appalled. His Fuhrer, Adolf Hitler–the man he had idolized for 14 years–had just passed a death sentence on Germany, the nation he claimed to love above all others. On March 19, 1945, facing certain defeat, Hitler had ordered a massive “scorched-earth” campaign throughout Germany. All German agriculture, industry, ships, communications, roads, food stuffs, mines, bridges, stores and utility plants were to be destroyed. If implemented, it would deprive the entire German population of even the barest necessities after the war. Now living in a bunker 50 feet below bomb-shattered Berlin, Hitler gave full vent to his most destructive impulses. “If the war is lost,” Hitler told Speer, “the nation will also perish. This fate is inevitable. There is no necessity to take into consideration the basis which the people will need to continue even a most primitive existence. “On the contrary, it will be better to destroy these things ourselves, because this nation will have proved to be the weaker one and the future will belong solely to the stronger eastern nation. Speer argued in vain that there must be a future for the German people. But Hitler refused to back down. He gave Speer 24 hours to reconsider his opposition to the order. “Then all is well,” said Hitler, suddenly with tears in his eyes. Filled with gratitude, Hitler signed the decree Speer had thoughtfully prepared before their fateful meeting. By doing so, Hitler unintentionally gave Speer the power to thwart his “scorched earth” decree. Speer had been the closest thing to a friend in Hitler’s life. Trained as an architect, he had joined the Nazi Party in 1931. He met Hitler in 1933, when he presented the Fuhrer with architectural designs for the Nuremberg Rally scheduled for that year. From then on, Speer became Hitler’s “genius architect” assigned to create buildings meant to last for a thousand years. In 1943, Hitler appointed him Minister of Armaments, charged with revitalizing the German war effort. Nevertheless, Speer now crisscrossed Germany, persuading military leaders and district governors to not destroy the vital facilities that wound be needed after the war. “No other senior National Socialist could have done the job,” writes Randall Hanson, author of Disobeying Hitler: German Resistance After Valkyrie. Despite his later conviction for war crimes at Nuremberg, Speer never regretted his efforts to save Germany from total destruction at the hands of Adolf Hitler. Fast-forward to the United States since the 2008 election of President Barack Obama. Republicans have adopted the same my-way-or-else “negotiating” stance as Adolf Hitler. Like him, they are determined to gain absolute power–or destroy the Nation they claim to love. Ronald Reagan presided over a tripling of the national debt–and raised the debt limit 17 times–during his eight years in the White House. President George W. Bush nearly doubled it again. But that didn’t become an issue for Republicans–so long as one of them held the White House. Republicans in Congress raised the debt ceiling seven times during the George W. Bush Presidency–when the national debt grew to $10.627 trillion due to tax cuts and wars in Afghanistan and Iraq. Only when a Democrat–and a black one at that–became President did Congressional Republicans consider this a danger. Suddenly, “fiscal integrity” became the byword of Republicans. And in its name, they repeatedly threatened to shut down the government if their legislative demands weren’t met. In April, 2011, the United States government almost shut down over Republican demands about subsidized pap smears. His conference would not approve funding for the government if any money were allowed to flow to Planned Parenthood through Title X legislation. Facing an April 8 deadline, negotiators worked day and night to strike a compromise–and finally reached one. Three months later–on July 9–Republican extortionists again threatened the Nation with financial ruin and international disgrace unless their demands were met. By refusing to raise the debt ceiling, they would force the government to default on paying the bills it owed. President Obama had offered to make historic cuts in the federal government and the social safety net–on which millions of Americans depend for their most basic needs. But Boehner rejected that offer. He would not agree to the tax increases that Democrats wanted to impose on the wealthiest 1% as part of the bargain.